Discussion in 'MacBook Pro' started by had0ukenn, Jan 13, 2015. I posted a couple of days ago but didn't find a solution, and my post ended up getting buried. Was wondering if someone could help me out. -Early 2011 MacBook Pro 13"
After doing a restart on my computer because it was lagging, I am now stuck at the loading screen of the mac with the animated loading icon. I was not doing any sort of OS installation or update, was just browsing websites with barely any programs running in the background. 3) Booted up holding cmd+S to launch singer user mode, typed fsck -fy in command prompt to see if it would help - showed that "the volume [SSD] appears to be OK - the volume was modified," I proceeded to type in reboot, but to no avail. 4) Booted up holding cmd+r to launch recovery mode to MAC OS X UTILITIES menu, verified disk and disk permission, everything appeared to be okay, I did not click on "repair disk" since I read not to do it if the verification was okay - this did not help my problem, did it 2-3 times, once with repairing disk permissions (Not the repair disk option) but to no avail. 5) Booted up holding cmd+option+P+R to reset NVRAM - Did not help, gave me a message saying "Unapproved caller. SecurityAgent may only be invoked by Apple software. I then tried booting in safe mode after this but it did not help, now its showing me this message. I want to be able to back everything up if possible, as I've mentioned already, I do not have a time machine back up. I was reading over some options that were available to me, I want to do the one where I can recover as much data as possible. I am going out to buy a 1 tb WD mac external hard drive to back up stuff on, if you guys have better alternatives please let me know. 1) Someone told me that I could make a backup of an image via disk utilities, what will this save and what will I lose by doing this? 2) I think the only option I have left is to reinstall the OS X. I've read people saying that my data will still be there but what I want to know is what will I lose and preserve by doing this method? 3) What caused this problem in the first place? I read that it could be because of the HDD (or SSD in my case), I use trim enabler and it showed the health of my SSD being at 100% so i'm not sure what caused this problem. 4) I've also read that you can bootup using the target disk mode onto another mac using firewire or thunderbolt, is this a better option than the ones ive mentioned or are the previous options better? 2. 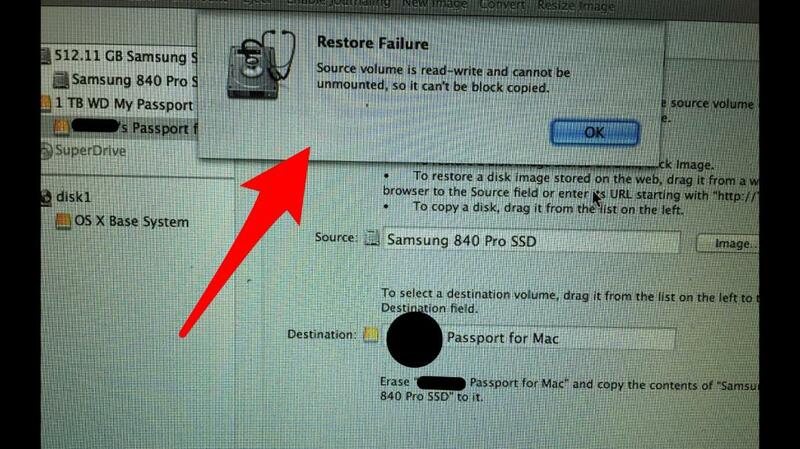 Command-r to recovery again and from there start Disk Utility. Format that new external to Mac OS Extended (Journaled). Now go to the restore tab of Disk Utility. Drag the internal volume (probably Macintosh HD) to the source tab then drag the external volume to the destination tab and click restore. This will clone the internal to the external, assuming the drive/data is readable. 3. Hard to say. Assuming you did not install any hardware or software that caused this and it just happened spontaneously, it sounds like either the drive is failing, or less common, the drive cable is bad. Format that new external to Mac OS Extended (Journaled). Now go to the restore tab of Disk Utility. Don't forget to use the "Partition" tab (change "Current" to "One Partition", then click "Options" and select GUID. No, this is not default when the disc you attach is formated in MS-DOS/MBR ---> MBR is default. When you connect these new MS-DOS/MBR formated WD externals, MBR is selected by default. I get that, but if you just go to the erase tab and select Mac OS Extended (Journaled) and apply that it will change it to GUID by default without going to options at all. I just did this on a USB key. Here is before and after with me doing nothing but a format in the erase tab. Yes, it is how it is supposed to work, I know. However, I have many examples that are different. Yesterday I got a new 2 TB WD external for a friend, arrived formated in MS-DOS/MBR, so I used the erase tab to HFS+ and "erased". Today I got a new Cruzer Switch 32GB Sandisk USB stick (MS-DOS/MBR). Went to the erase tab / HFS+ / erase. So, I can't say why it sometimes does not work as expected, but this is the reality. That's why I think that one should ALWAYS use the Partition tab / Options to check that GUID is selected. For some reason, I don't have a partition tab for my external drive. "1 TB WD My Passport" is the whole disc, that can be partitioned (even in ONE partition) = Partition tab available. "xxxx's Passport for Mac" is a partition of the 1 TB WD disc = no Partition tab available (you can't partition a partition). Thanks for clearing that up for me. When I'm doing the restore process onto my external hdd, do I select the partition of my ssd for source, and for destination I select the partition of my external hdd? It looks like you have done everything correctly and this should work. I suspect whatever the underlying problem is here with the drive is preventing the copy in Disk Utility. The only other thing I can think to try is to put the drive in an external USB enclosure and see if it can be read from another Mac that way. It is less common, but it is also possible the drive cable is bad. Putting the SSD in an external enclosure then trying to option key boot to it would eliminate the drive cable from the picture. I am currently making a new image of my SSD onto the external HDD, after that I am going to try internet recovery, and if that doesn't work, I was thinking of reinstalling the OS. Are you familiar with disk image back ups? You mean using Disk Util to make a DMG image of the disk? Yes that could work, but I will be surprised if it does given what we are seeing here. I also would be surprised if a OS reinstall fixes this. The OS does not just spontaneously fail without you having done anything. I really think you have a bad drive or bad drive cable there. My concern over a OS reinstall is if you have data on there you need to recover, you may be complicating that by writing to the disk further with an OS reinstall. So far the image is being written onto the external , all i can hope for is that it runs fine after backing it up. What is the difference between this method and the one you mentioned before? Everything seemed to be running fine, i recently installed AVG antivirus, I believe that may be the culprit but i dont know if its capable of causing this problem to my macbook. Ive read people saying that reinstalling the os would retain my data and apps but would just overwrite the OS files only. There was also something about using internet recovery, not sure about that option. If your HD is failing and you are trying to recover / backup important files, writing to or over the HD via an install etc. can jeopardize recovery efforts. I believe that that is what Weasel was pointing out. This will be an image of the drive and all your data "inside" the DMG file (kind of like a ZIP file of the whole drive). So this image will not be bootable. You will need another, operating make to open the image and see the data. Even is AVG had borked things, the safe mode boot you tried would have bypassed the AVG startup items and overcome that. So I doubt that's it. I've read people saying that reinstalling the os would retain my data and apps but would just overwrite the OS files only. There was also something about using internet recovery, not sure about that option. Yes, that is correct. But like BasicGreatGuy mentioned, I am concerned you will make any data recovery more difficult by doing a reinstall that writes data all over the disk. Just based on that you have described here so far I really think you have a bad disk or bad drive cable. I see, i was kind of counting on this method. Okay, so its like a zip of my data. I dont understand why it was giving me trouble with doing it your way. Would you happen to know why i was getting the message in the picture? i have an external hard drive enclosure, it is a USB 2.0, though, does it matter or do i need thunderbolt/firewire/usb 3.0? I guess this way i can find out if the problem is with my SSD, i can try to buy a drive cable to see if it solves the problem, i would rather avoid the hassle with losing my data through these other methods. I suspect because of the underlying drive/cable issue. USB2 will work fine for testing. It will just be very slow, but if it works even though slowly that tells you it is the internal cable. So i ended up swapping out my SSD for the stock HDD that my mac came with, to make sure it wasn't the hard drive cable causing the issue, it seems to be running the HDD fine. I guess the problem is either with my SSD or the software itself on my SSD. I ended up making a disk image of my SSD onto my external drive, it took about 2 days. Just so I know i have some kind of back up of it. I have an external hard drive enclosure that can house my SSD but its a USB 2.0, i will try to boot from that and see if it works. At this point, what do you recommend i should do? Thanks for all your help so far. This to me confirms cable failure. Because the hard drive communicates with the computer more slowly than an SSD, it is more tolerant of a poor quality cable. I just booted up my ssd from an external enclosure, seems to Load fine. So this is for sure the hard drive cable then? I would give it a 99% change of being a cable failure. I mentioned before that i made a backup image of my drive, however now that i can access my SSD fully with the external enclosure, can i make a time machine back up of it to my external while i have both devices plugged in? Also, any idea where i can get a good OEM hard drive cable for my mac and how much it would cost? Thanks.